A computed facet is a type of SmartFacets™ that presents one or more computed values for each facet item. The computed values can either be the sum, average, minimum, or maximum of the values found for the numerical field associated with the facet. Like other facets, the content of the facet is updated each time you perform a new query. Using a computed facet in combination with other facets allows you to drill down in your numerical data. Example: When you index data from a customer relationship management (CRM) system such as Salesforce, a computed facet can display sales results per account, per region, or per sales person. 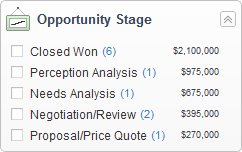 In the following figure, the computed facet presents the total sales results per Salesforce opportunity stage. The numbers between the parentheses represent the number of opportunities for each stage. Refining the search, let's say to year 2011 with the Year facet, would update the Opportunity Stage facet to show 2011 opportunity stages. The computed value can appear either on the right or below the caption of each facet item. A prefix and a suffix can appear before and after the value to help describe the meaning of the value. 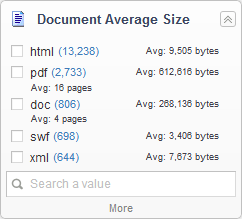 Example: A Document Average Size custom facet could show the average file size and the average number of pages for each document type. Note: When it is not possible to compute a value, like the average number of pages for HTML documents, the value simply does not appear.